The Aprilaire 1850F portable basement dehumidifier is designed to remove up to 95 pints per day in a smaller, compact cabinet size making it ideal for attics, crawlspaces, HVAC closets and basements. Covers areas up to 2200 sq. ft. Made in USA. Out of Stock. This item is temporarily on backorder until 2019. As an alternative we recommend the Fral FDK 100. 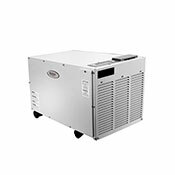 The portable Aprilaire 1850F 95 pint whole basement dehumidifier is the latest, most reliable solution to relieve excessive humidity in your basement or larger areas throughout the home. Unhealthy humidity levels, above 50% for a continuous time period, allow mold, mildew and bacteria growth to enter your home, making it particularly dangerous for people with asthma and allergies. Crawl spaces and basements are a major source of air infiltration that permeates up into your living area, bringing odors, allergens and other contaminants along with it. We recommend keeping humidity levels between 35% and 45% to maintain a healthy, comfortable environment for you and your family. This free standing, ultra-quiet portable dehumidifier provides 100% more capacity and 300% more efficiency than any leading portable dehumidifier. Best of all, this unit does not require bothersome and expensive installation work into your HVAC system as compared to other larger dehumidifiers! An internal humidistat will automatically sense moisture levels to maintain optimal humidity levels and reduce and control dampness, mildew, mold, fungi, dust mites and odors. The 1850F model operates down to 40°F and effectively removes 95 pints of moisture per day for areas up to 2,200 square feet with no messy buckets or tanks to empty. Other features include a MERV 8 washable air filter, sturdy, long-lasting construction, and caster wheels for easy maneuverability. This dehumidifier is also equipped with a highly efficient, eco-friendly R410a refrigerant. With our unique Aprilaire 1850F portable dehumidifier, you can now enjoy a comfortable and healthy home for years to come. Requires a large capacity freestanding dehumidifier without the need to be connected to a HVAC system. Wants low maintenance with no messy trays or buckets to empty and simple once a year filter cleaning. Wants a highly reliable system to effectively maintain a comfortable climate. Needs a smaller cabinet size to fit into attics, crawlspaces and basements. Once per hour the dehumidifier will measure the humidity level of the air and compare it to the humidity setting. If the humidity in your home is higher than the setting, the dehumidifier will dehumidify the air until the humidity level drops below the setting. The Aprilaire Model 1850F is designed to dehumidify the air coming in to the unit by passing the incoming air over an evaporator coil to drop the air temperature below the dew point of the air. Moisture is removed from the air and drained out of the unit to a common floor or waste drain. The air is then reheated in the condenser coil and exits the unit. Under normal circumstances, the filter should be cleaned or replaced once a year. To clean, flush with warm water and detergent solution then let dry. Please note: When first installed, your dehumidifier has to remove all the moisture that is initially in your home. We recommend setting the humidity level at 55%RH when first installed. Allow the dehumidifier to run until it reaches the setting then adjust the setting to your desired comfort level. If you need a top quality, powerful high-capacity dehumidifier without any duct work or complicated operation, the Aprilaire 1850F will not disappoint. This unit will quietly and effectively remove up to 95 pints of excess moisture in finished or unfinished basements up to 2,200 square feet. It's energy efficient, compact and portable design can remove three times the moisture than standard portable dehumidifiers. Thanks to the housing and insulation, this powerful machine moves large amounts of air yet remains relatively quiet. This dehumidifier will quickly lower humidity levels even at temperatures as low as 40 degrees. Designed to remove up to 95 pints of excess moisture per 24 hours (11.9 gallons). A 3/4' PVC adapter is included and allows you to connect this dehumidifier to a hose and drainage system or condensate pump. You may also gravity drain into a floor drain or sump pit. Locking caster wheels and lifting handles make this unit easy to maneuver and with no duct work necessary, installation is a snap! Just set it and forget it; the internal humidistat will automatically maintain optimal humidity levels. Washable filter is easily accessible making filter maintenance hassle free. Has undergone rigorous reliability and durability testing, assuring the high-quality performance you expect and comes with an exceptional 5-year warranty. There is no collection bucket; this unit must be drained through a hose or condensate pump. The Aprilaire 1850F high capacity dehumidifier offers reliability, durability and exceptional performance while offering low maintenance features allowing easy set up and operation for homeowners. This machine is often compared to similar or even larger sized units, but it removes up to three times more moisture and operates in temperatures as low as 40 degrees. Automatic humidity sensors, frost protection, and quiet operation are just a few of the features that make the Aprilaire 1850F not only a superior choice, but also a key ingredient to maintaining a safe, healthy and comfortable home environment. This item is temporarily on backorder until 2019. As an alternative we recommend the PowerPure 5000 Warm & Cool Mist Ultrasonic Humidifier. Please Note: If ducting in from and/or out to an adjoining room or for different room size applications we have other model choices. Please call (888) 236-7231 to discuss this with a product specialist.